Honey bees build their nest from combs configured around six-sided cells of two sizes. The majority of the bee hive consists of sheets of comb with five cells per inch. This size cell is used by the honey bees to rear their brood and to store honey and pollen. The bees also build comb with cells that are slightly larger, measuring about four cells per inch. 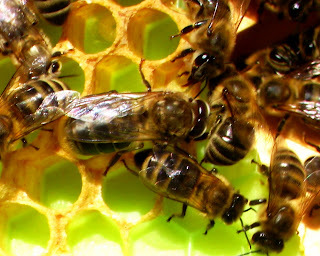 The larger cells are used for rearing drone brood; but if the colony does not need additional drones, worker bees will use the drone brood cells to store honey. 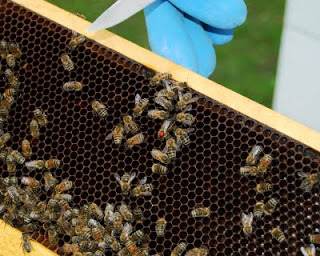 Honey bees typically build their drone brood cells along the lower edge of worker brood frames and on burr comb, any comb that is not built in straight, parallel sheets. Honey bees readily draw-out drone brood cells on frames of drone brood foundation. 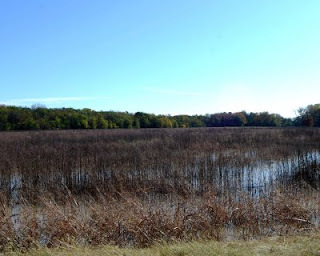 These frames can be a useful part of an integrated pest management plan. Desirable honey bee genes can be increased in the drone concentration areas by using drone brood frames. Freezing the drone brood frames is a good method of removing bees with bad traits from the gene pool. Also, freezing the drones from queen mother hives lessens inbreeding. Using drone brood frames has other benefits. With drone brood foundation available, the bees build less burr comb, resulting in fewer places for small hive beetles to hide. The drone brood frames provide a useful place to sample Varroa mites. The mites can be easily measured by removing a number of drone pupae from their capped cells. Excessive mite loads can be reduced by freezing the frames of drone brood. Replacing the frozen drone frames in the hives is a method of testing the hygienic behavior of the bees. The more hygienic bees will quickly remove the pupae killed in the freezer. At Peace Bee Farm, 10 percent of all brood frames are the green-colored drone foundation frames. The pictured bee with the large eyes is a drone; he is surrounded by workers. A drone larva is in the upper-left cell. It has been three years since the start of the greatest recorded die-off of honey bees in the United States. With annual losses of managed honey bee hives at around 30 percent, there is still no clear, single known cause of this condition, known as CCD, or Colony Collapse Disorder. From a long list of possible causes of Colony Collapse Disorder, a shorter list of possible causes has emerged. The first candidate for a CCD cause to be eliminated was electromagnetic energy from cell phone towers. Strong candidates for possible causes still remain: colony stress resulting from nutritional problems, transportation of hives for pollination service, chemical residues from fertilizers, pesticides, and herbicides, and new or re-emerging bee diseases and pathogens. Researchers have found traces of many chemicals in the beeswax honey comb of hives that collapsed as well as in those that did not. Beeswax readily holds chemicals; and some of the chemicals were introduced into the hives by the beekeepers to control parasitic mites, while some of the chemicals were brought into the hive by the bees as they picked them up while foraging for pollen and nectar. Peace Bee Farm is participating in long-term studies that are now being conducted to measure the effects of three areas of concern. First, honey bee diseases are being studied, particularly new viruses and fungal diseases. Second, parasitic mites, the great killers of honey bees, are being sampled. The mites are known to vector numerous viruses. Third, pesticides are being sampled from the beeswax honey comb and from bees. Click on the picture to see where I am cutting comb from the brood nest for the pesticide test. Any chemicals present in the beeswax comb here surround the developing honey bee brood. The queen bee, marked in red, is encircled by her retinue of attendant worker bees. For these studies, we are collecting samples of beeswax and bees. There is considerable interest developing among beekeepers to move away from the use of chemicals in the hive to control honey bee pests. Historically, beekeepers managed honey bees without chemical treatments; but practices changed after the introduction of parasitic mites in the 1980s. As the mites devastated bee hive populations across the country, beekeepers turned to chemical pesticides to control the mites. With each product that was used, there was early success in controlling the mites followed by resistance to the chemical agent. Now many beekeepers are moving toward chemical-free beekeeping in an attempt to breed bees that are genetically adapted to living in the presence of the numerous honey bee pests. Those that are adapted will be the survivor bees left after the colonies with less suitable traits have died off. Without defined best practices, beekeepers are experimenting with a number of techniques to manage honey bees in a chemical-free manner. The first step is to make colony divisions in the spring from those colonies that survived the winter and then built up their populations the quickest. Just making numerous colony divisions, or splits, makes up for the losses that will occur as colonies that are not suited to living with pests die off. 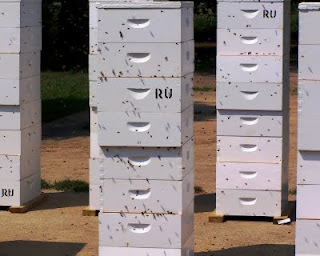 Chemical-free beekeeping employs an array of integrated pest management techniques. These include a series of steps taken to weaken the pests and strengthen the bees’ chances of survival. Mechanical controls, like small hive beetle traps, are used because they remove the pests without building resistant populations of the pests. Cultural practices, like removing and freezing frames of drone brood containing developing mites, also reduce pests without building pest resistance to chemicals. Biological controls are important pieces of the integrated pest management approach to chemical-free beekeeping. 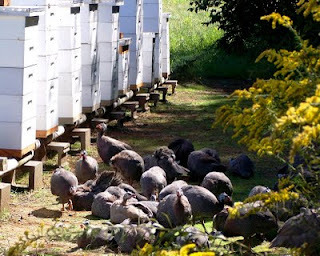 In the photo, some of our guinea fowl frequent one of our bee yards. Unwanted insects, like small hive beetle larvae crawling to pupate in the soil, don’t stand a chance around keen-eyed poultry. Many beekeepers seem to love their bees; however, not too many people other than beekeepers like to have large numbers of bees close at hand. Some people fear honey bees as well as other stinging insects. A small number of people have allergic reactions to the venom of bee stings and need to avoid contact with bees. For these reasons, it is important that beekeepers maintain a safe environment for humans, pets, and livestock near the bee yard. Most beekeeping associations train new beekeepers on techniques for lessening problems associated with maintaining harmony between beekeepers and their neighbors. These good neighbor practices are particularly suited for honey bees kept in urban settings. Many managed colonies of honey bees are kept in hives in backyards of major cities as well as surburban settings. The beekeeper's first consideration is placing bee hives so that the flying bees will not regularly encounter people. A fence or evergreen hedge near the entrance to the bee hive will force the bees to fly over the obstacle, and this keeps the bees flying above the heads of neighbors. A hive hidden from view of the street is less likely to be vandalized as well. Backyard beekeepers should watch the behavior of the bees and remove the drones and replace the queen of any highly defensive colony. In areas with Africanized Honey Bee genes, bees should be kept in more isolated bee yards. Providing a source of water for the bees helps keep them out of the neighbor's swimming pool. Bees love the flavored water of swimming pools. Most beekeepers share honey with their neighbors. 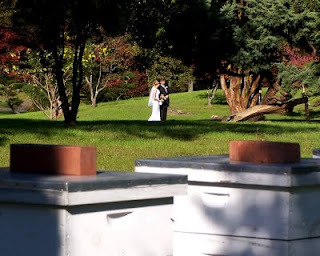 Today, while working my bees that pollinate the beautiful Memphis Botanic Garden, I noticed a wedding was in progress nearby in the Japanese Garden. My beees, located in the Urban Orchard, are visited regularly by the public. A juniper hedge keeps the bees aloft. Beekeepers share the craft of handling and caring for honey bees through educational associations at the local, state, and regional levels. Typically, local associations cover an area of one or more counties and meet monthly with programs devoted to beekeeping activities as they change throughout the year. Our local group, the Memphis Area Beekeepers Association, meets monthly in Memphis and has membership across portions of three states, Tennessee, Mississippi, and Arkansas. State-wide beekeeping associations typically meet once a year in the fall after the honey harvest for an educational program which often includes beekeeping expert speakers brought in from outside the state. Rita and I recently traveled to the mountains of northern Arkansas for the Arkansas Beekeepers Association's annual meeting. Next, we traveled to the hills of Middle Tennessee to attend the Tennessee Beekeepers Association's annual conference. Speakers at both of these meetings covered topics of honey bee health. Beekeepers honed their beekeeping craft skills by participating in honey show events. The manufacturers of bee hive equipment brought their products to demonstrate to beekeepers. Many attended the conferences to meet with friends that they only see once a year. The topics discussed at the meetings included new trends in beekeeping that move away from the use of chemicals. Other presentations featured the marketing of honey and bee hive products and reports on research being conducted on honey bee health. Rita and I have served as officers of both the Memphis Area and Tennessee beekeeping organizations. I am concluding my service as president of the TBA. 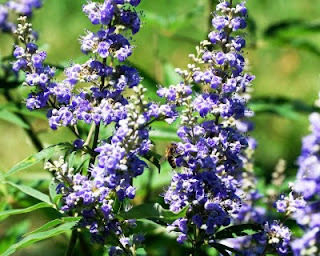 Today's photo shows a honey bee collecting nectar from the blue-colored flowers of vitex. Vitex is a large shrub or small tree which blooms throughout the end of summer and into the fall when few flowering plants can be found by the honey bees. 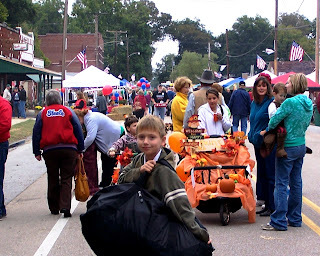 October is the time of the year that people celebrate the harvest, and fall festivals are being conducted in many communities. Farmers markets are winding down for the season as summer time crops stop producing. The favorite summer vegetables are becoming harder to find. The fruits of the gourd family are plentiful now. Local growers are bringing decorative gourds, yellow squash, butternut squash, cucumbers, and pumpkins to the farmers markets. The gourds are dependent upon insects for pollination. Without pollination no fruit or seed is produced. With honey bees and native pollinators declining in numbers, growers in some areas have experienced diminished yields and misshapen fruit. There has been plenty of activity at Peace Bee Farm. Saturday found Tod and Wes selling honey and bee hive products at the Memphis Farmers Market. Christina and Rita were selling our products at the Crawfordsville, Arkansas Fall Festival. The festival brings quite a number of people to this town with a population of 606. Grandson, Ethan, was helping me extract Delta cotton honey in the honey house when we got a call from Rita saying they needed more honey and warm clothes on this chilly fall day. In the photo, Ethan carries a duffel bag full of sweat shirts to our family and our friends manning adjacent booths at Crawfordsville. The cool weather with plenty of rain is producing a good stand of purple top turnips here at Peace Farm. We will enjoy the greens and turnips throughout the fall and winter, and then we will let the plants bloom and produce seed in the spring while feeding our bees. Turnips are in the important bee plant family, the mustards. I think these cool days call for some cotton honey over some hot, buttered sourdough pancakes. I still have some McCarter’s coffee with chicory to go with this tasty meal. The ground chicory root comes from another important bee plant family, the composites. Thank you, honey bees. Each year, Peace Bee Farm participates with a large number of governmental agencies and agricultural businesses in a farm safety program in West Memphis, Arkansas for fifth-grade students. The purpose of the program is to inform these young people of the many potential hazards that may be present on the farm. The program also exposes the children to the wide range of activities to be found on farms. The students rotate through a series of stations, each devoted to a particular aspect of farm activity. The fire department brings in a portable fire safety house. There is a station for tractor safety and a most interesting demonstration of the hazards associated with grain storage and handling equipment. The Arkansas Game and Fish Commission officers conduct a firearms safety session for each of the students. Other experts tell how to identify and avoid the venomous snakes which can be found in the Arkansas Delta. The children are all given the opportunity to handle a non-venomous speckled kingsnake. Rita and I spoke to the 200 children in attendance about safety around honey bee hives. We explained that honey bees are relatively gentle insects that rarely sting except in defense of their nest, the bee hive. The sting of 500 honey bees is roughly equivalent to the venom available from a rattlesnake. A bee hive will typically have 2000 guard bees protecting the entrance to the hive. Each hive, therefore, has the equivalent of four rattlesnakes on duty. Colonies with Africanized Honey Bee genes engage even more bees to guard the brood nest. We tried to warn the students of the danger associated with vandalizing bee hives. Unfortunately, vandalism is fairly common in many places that honey bees are kept. After a few brief words about safety around bee hives, we were able to answer numerous questions about the life of honey bees. 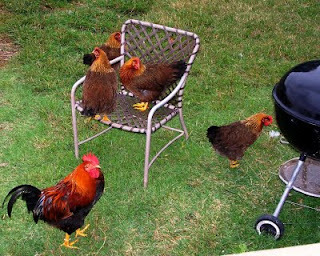 Upon returning to the farm, we found the Welsummer chickens relaxing around the barbecue grill. Honey bees generally store honey in two places in the hive: adjacent to the brood along the edges of the frames and in supers above the brood nest. The honey that the bees place on the edges of brood frames is close and convenient for the bees to mix with pollen to make bee bread to be fed to the rapidly growing larvae. The honey that the bees store in the honey supers above the brood nest is available to be harvested if the beekeeper considers it a surplus. The beekeeper must estimate how much honey will be needed for the colony to consume over the upcoming winter. If the beekeeper is too greedy and removes too much of the honey, the bees will starve over the winter. The beekeeper removes the supers and extracts the honey. After the honey has been spun out of the frames, there remains a thin coating of honey that needs to be removed before the frames are stored away over the winter. A convenient way to clean the honey from the equipment is to stack it outdoors and allow the bees to collect the remaining traces of honey. In the photo we see foraging bees surrounding stacks of “wet” supers holding frames sticky with a thin coating of honey. After a day of exposure to the bees, the supers will be clean and dry and ready to store. Supers are usually stored with moth crystals to protect them from wax moth damage. In preparation for fall set-up of a hive for winter, it is important to remove the queen excluder from the hive. If a super of honey is left as winter food above a queen excluder, it is likely that the cluster of bees will move up through the excluder and leave the queen on the lower side because her body can’t pass through. Without the cluster of bees surrounding her, the queen would die in cold weather. The Endless Feast is an attempt to showcase locally grown foods and the farmers that produce them. The Endless Feast promotes family farms, organic farms, sustainable agriculture, healthful eating, nutrition, and appreciation of the efforts required to bring food to the table. The Endless Feast shows how the food is produced by visiting the farms where the ingredients are grown, interviewing the farmers, and watching them go about their daily farming endeavors. After being introduced to the farms and the farmers, a group of one hundred is served a gourmet sit-down dinner served outdoors at one of the farms. The Endless Feast is preparing a meal to be served at Whitton Farms, the flower and produce farm owned by Jill and Keith Forrester. Chef Lisa Godsey of Godsey’s in Jonesboro, Arkansas is preparing the meal from foods produced locally in the Arkansas Delta. Peace Bee Farm will be supplying late summer cotton and wildflower honey to be used in a pumpkin soup. 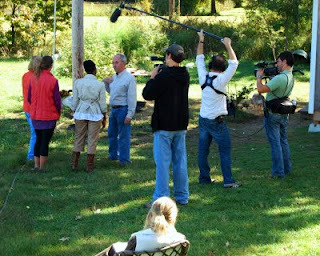 In the photo, I am being interviewed at Peace Bee Farm by New York wellness instructor, Ebeth Johnson, for an upcoming segment of Endless Feast, which will be broadcast on PBS. The film crew is from Film Garden Entertainment of Van Nuys, California. Rita Underhill and Jill Forrester are on the left, both wearing red vests. I showed our guests around one of our bee yards. Today’s sunny skies and pleasant weather, a break from days of rain, brought the bees out of the hives and allowed us to move in for a close look. Next, we went into the honey house to see how we extract the honey. Jill and Ebeth got to taste some comb honey from our bee hives that are located at Jill’s Whitton, Arkansas farm. Jill was delighted that the honey tasted as great as the appearance of her flowers that supplied nectar that the bees used to produce this honey. Ebeth wanted some hot biscuits to go with her Delta honey. You can find her at http://www.consciouscravers.com/. The honey bee is the only insect in the temperate region that remains active throughout the year. Most other insects either die in the winter or go into hibernation. The honey bee is able to maintain winter activity by producing and storing a high energy food, honey, to sustain the colony while flowering plants are not available. The honey bee stores its winter time food stores of honey in comb above the brood nest. The bees don’t measure the amount of honey that they have stored and compare it to their population while estimating the length of winter. They just go out and collect nectar whenever it is available. A strong colony will actually make a surplus of honey if plenty of flowers are blooming. It is the beekeeper’s task to take some of the surplus honey from the bee hive and place it into a useable container so that it can be enjoyed by humans. When the honey bee completes its conversion of flower nectar into honey, it becomes a unique food that will virtually last forever. The honey is removed from the frames of comb in the honey supers by spinning the frames in the extractor. Honey pours out and is strained to remove flakes of beeswax from the comb as well as any foreign matter from the hive. The water content of the honey is measured to ensure that the bees have completed the evaporation of the honey. Next, the honey is placed in a bottling unit and allowed to settle. While debris settles to the bottom of most liquids, any foreign matter or bubbles in honey rise to the surface. In the photo, Rita pours a one pound jar of Arkansas Delta honey. At Peace Bee Farm all of our honey is the raw, unprocessed product of the hive. This honey is ready to be poured over a hot buttered biscuit. When goldenrod is in bloom, it is one of the most easily recognized plants of fall. We often find large stands of the bright yellow flowers at the edge of woodlots, fields and along roadsides. Goldenrod is one of the most prolific of the bee plants. It produces large volumes of nectar, making it the source of much of the honey that the bees use to overwinter. Goldenrod is a member of the family of important bee plants, the composites. 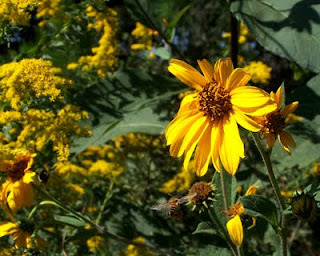 The composite, or sunflower, family is known for producing large amounts of nectar and pollen. The composite family includes dandelion, coneflower, black-eyed Susans, asters, chicory, and thistles. Goldenrod’s large heads of clusters of tiny yellow flower stand four to five feet above the ground. On sunny fall days, the open flowers of goldenrod will attract great numbers of honey bees as well as numerous other insects. It is not uncommon to find honey bees sharing goldenrod with solitary bees, flies, moths, butterflies, and other insects. 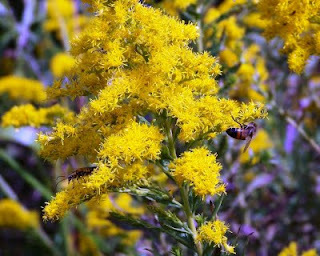 If you click on today’s picture, you can see a honey bee sharing goldenrod flowers with soldier beetles. A handy internet tool for helping to identify insects can be found at: http://bugguide.net/. Most fall honeys have a more robust flavor than summer honeys. Goldenrod honey is bright yellow in color. It has the fragrance of wildflowers and a pleasant taste. A strong nectar flow from goldenrod often determines the survival of honey bees over the winter. Oh, by the way, goldenrod is not responsible for hay fever in the fall. The offending plant is usually common ragweed, which blooms at the same time. The beautiful goldenrod plant is being cultivated as a garden flower. Goldenrod is a friend of honey bees and beekeepers. The great observer of the natural world, Charles Darwin, spent a lifetime making observations and meticulously recording his notes. Much of his observations involved honey bees. One of the observations that he recorded is the bee behavior known as flower constancy. Individual honey bees will continue to forage on the same species of plant as a source of nectar or pollen as long as the plant produces a reward to the bee. A honey bee will move from flower to flower of the same species even though there may be other plants in bloom. Other bees from the same hive may forage other species of plants. Continuing to work the same species of plant makes the honey bee the most effective and efficient pollinator for agricultural crops. Click on today’s photo. A foraging honey bee moves from one perennial sunflower to another, exhibiting flower constancy. On the left side of the photo, we see a carpenter bee that has just left the sunflower in the center flying to nearby goldenrod flowers in the background. Many solitary native pollinators, like the carpenter bee, do not exhibit flower constancy.